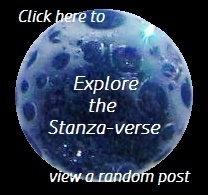 Turning In | What Rhymes with Stanza? It is 10 PM. My dog Chules stares up at me from the floor, where he has been sleeping most of the evening. He wants to catch my eye so I will realize it is bedtime. I’m not sure how he distinguishes between his many naps and bedtime, nor do I understand why he feels responsible for getting me to turn in at this particular hour. Nonetheless, bedtime it is. As per ritual, I open the front door so he can go outside and relieve himself one last time. Not wanting to draw moths to the light inside, I step out onto the porch, close the door, and wait in the dark for Chules to finish his business. Sometimes he gets right to it, sometimes he goes off on a final check of the yard’s perimeter. On warm nights like tonight, he is just as apt to sit on the lawn and gaze at the stars. I join him in sitting and gazing, though I’m certain our ruminations run on very different tracks. it is quiet tonight except for the chirping of crickets. I don’t recall having heard them for quite some time, and I find comfort in the familiarity of nature’s music. So much of it has gone missing. After a time, I stand and Chules comes trotting back to the porch. We go inside and — having settled my mind and his kidneys — we retire to our beds in peace. This entry was posted in Animalia, daily prompt, Haiku, nature, poetry, prose and tagged Chules, crickets, dogs, dVerse, haibun, night, pets, poetry challenge. Bookmark the permalink. You wrote of my night ritual with my dogs. In fact, last night the crickets seemed so loud, so desperate that I couldn’t have missed them. Is Chules an American Eskimo? I shared life with one about ten years ago–sweet dogs. Yes, he’s an eskie. He’s my first dog, as I was always a confirmed cat lady. Now I can’t imagine life without him. I can’t imagine life without my dogs, either. Our eskie was a rescue. We only had her 5 years. Makes me sad. Why would someone give up such a sweet dog? A lovely haibun, and gentle rocking of the prompt. Your haiku is delicious. Your prose is a sweet slice of life. Our pooch passed a decade ago, and I still miss her. They stay always in our hearts, don’t they? Thank you for the kind words. I love your snapshot of those moment before you and Chules head for bed — nicely done! Thank you. He brings comforting structure to my life, moment by moment. What a lovely evening habit with a beloved companion! You took us along with your lovely descriptive writing. Thank you! Love your haiku. So good that you sit with your dog and look at the stars. Beautiufl. That is the kind of friend to have! This is such a sweet tale of woman and dog, and then you drop that last line – such a punch. Surely nature’s serenade includes you. Oh! I’m only referring to the notion that the crickets are serenading in order to attract a mate! Nothing more. Nature’s serenade most certainly includes any who will listen. Proof that the audience projects meaning into our words. Phew. I love your letting us in on the nightly ritual with you and Chules. My hsuband’s dog died several years ago and it broke his heart so, we will not have another. the haiku is lovely. I am sorry for his loss, and sorry for his pain. Sometimes things continue to hurt even once they are healed. I am glad you enjoyed the haiku. Oh I love this, and eavesdropping! I so enjoyed following your nightly routine, Maggie – and what a sweet dog! Dogs and cats know when it’s time to go to bed and don’t like changes to the routine. I miss that nighttime wait outside the door since we lost our little dog. I love the image of dog and human gazing at the stars. I also love how the crickets chimes in the final paragraph and came to a beautiful crescendo in the haiku – eavesdropping on songs not meant for you – love it! Thank you! I’m sorry for the loss of your companion. Dogs can bring so much joy into our lives. I felt like I was eavesdropping with you…and the punctual Mr. Chules. Delightful haibun for us dog lovers! Thank you. I figure he must have a timepiece hiding somewhere under all that fur. Beautiful. ❤ You will always have this. And I know the stare. Bestia pulls the same thing on you? It must come from the “This is for your own good” gene. Oh, I get that look, too. but instead of a bark, it ends with a pathetic sigh. What are the stars to dogs? What I’d give for just one minute in a dog’s mind.